Perfect for princesses of all ages. 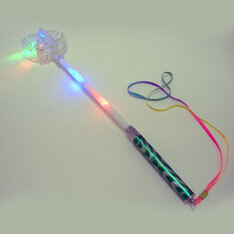 14 ” Flashing wand with the push of a button there is 3 dazzling light settings. Poly bagged and sold by the dozen. $11.15 per dozen for 15 dozen or more. $9.85 per dozen for 30 dozen or more.